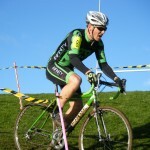 RD3 Race Report, Photos & Results. With a heavy overnight frost/ice and freezing fog this was a great start to the day but by the time the first race started the sun was blazing and very little wind made for fantastic race conditions. The U12’s did a shortened course based around the top field area and had a gentle climb in to test the younger ones. 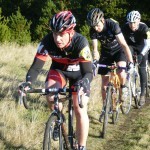 D Holmes led from the start with P Errington chasing behind and A Brown chasing Paul it was a great battle. 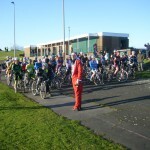 The gaps started to grow slightly as the race progressed but all riders kept their positions for the finishing flag. 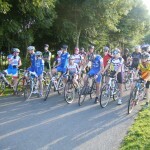 Then it was onto the older kids U16/14’s which was based around the full 1.22mile adult circuit. The ground was starting to soften in places with the sun melting the overnight frost but was still good going. C Aspey led from the start and knew the course well with A Brown holding a gap to maintain second place. 3rd place S Myers was starting to catch A Brown on the last lap but Angus had a strong finish and kept 2nd overall. The last race of the day was the main race with Sen/Vet/Lady & Jun doing the full 50-60mins. The course was in very good condition considering the recent weather and there was only one soft short muddy uphill section to tackle. 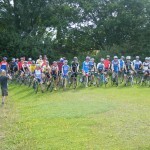 There was a great mix of up / down / singletrack and off chamber corners. 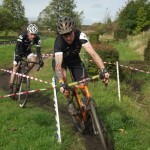 There was some great battles between many riders and including plenty of singlespeed nutters. On that note Colin May Velo Club Edinburgh took the overall win on the day by a clear margin with A Burridge SWARM taking second and C Donaldson GS Metro third . 1st V40 G Mount, 1st V50 P Robson, 1st V60 J Carr and 1st Lady was H Ingoe. Many thanks to Geoff Turner & all the helpers / marshalls from Barnesbury CC for orgainising the event. Also a thank you to the Council for the use of the land. The photos are here https://picasaweb.google.com/neccl247 and the full results are in the RESULTS Section. One Peak of Hetton – Yes it was back again for another season for riders to test their legs out on the One Peak of Hetton 1.4 mile course. Scot ran the course in an anti clockwise direction so the riders had a helping hand from the strong breeze to reach the top every lap 🙂 In the Main race the drizzle kept off and the sun even came out for the laps few laps. There was a pack of fiver riders for most of the race with a couple dropping off near the end. On the bell lap C Ash and C May were wheel to wheel with C May (Velo Club Edinburgh) taking the win on the line 8 laps 51.44 with C Ash (Blackhawckbikes) second 51.45, M Graham (Dirt Wheels Cycles) coming in third 53.01. 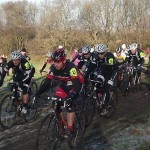 There was close battles between small packs of riders making a great race. Evey rider who signed on got a goodie then after the refreshments they all got a prize. In the U16/14/12’s race J Howard (Cleveland Wheelers CC) led from the start to cover 4 laps in 28.18, A Brown (Infinity Cycles) second then P Errington (Hetton Hawks CC) third. The firsts race of the day was on a shortened course and A Brown U10 (Hetton Hwaks CC) led from the start and had a very strong race covering 5 lpas in 11.54, second was Lititia Hay U8 (Hetton Hawks CC). All the kids got goodies after there races. Many thanks to MBE, Springboard Sunderland, Sunderland Council, Tony L & helpers. 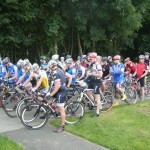 Photos are here https://picasaweb.google.com/neccl247/MBEOnePeakOfHetton and results are in the One Peak 2012 Section.